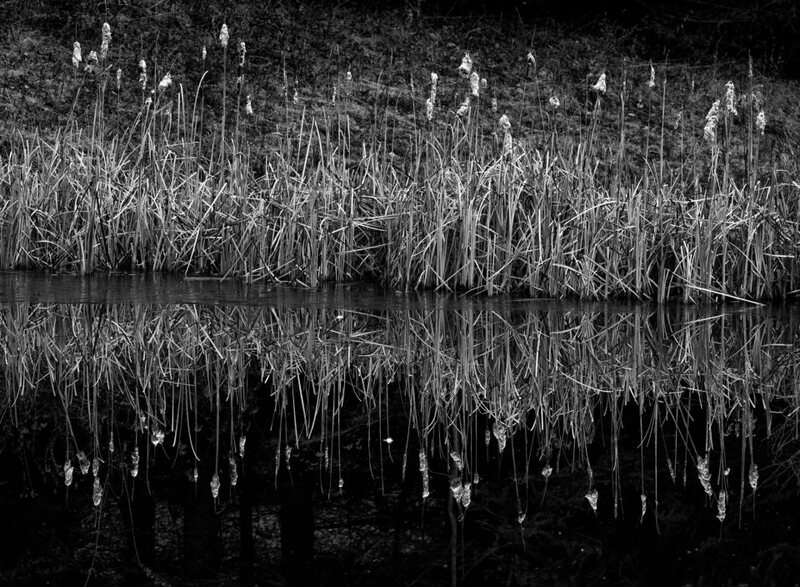 Cattails in a winter marsh, with a skim of ice on the water. This chilly picture seems to be the very essence of cold. But actually this is an image of potential warmth. You’ve seen cattail seed heads, I’m sure, when they’re just ripe–they look like a brown velvet hot dog impaled on a stick. Just one of those spikes can hold an unbelievable number of seeds–somewhere in the vicinity of a quarter of a million seeds on each stalk. Each individual seed is a tiny dot, almost invisible, attached to a little cluster of fluff, which acts as a parachute so the seeds can disperse on the wind. In late fall the seed heads burst open, losing their brown velvet appearance, and look bedraggled. But the cattail fluff is still velvety, thick, soft, and warm–one of the warmest natural substances there is. Native Americans used it to line moccasins and papoose boards. Pioneers used it to stuff quilts. It makes a superlatively cozy mouse nest. It’s also a really good tinder for starting fires. And in spring dozens of species of birds will use leftover cattail fluff to line their nests, making a soft bed for new-hatched babies. Wrens, vireos, sparrows, warblers, red-winged blackbirds grab beakfuls of fluff for nest material. Cattail fluff is so light and, well, fluffy that even a hummingbird can carry a big chunk to stuff into the nest. This cold swamp is a haven of warmth. Thanks to Wells Horton for this beautiful image that led me to reflect on the value of cattails.